Are you ready for summer yet? While the temperature here in New Mexico is still in the “I can’t decide if it’s summer or winter” mode with 80 degree days and 25 degree nights, we all know that sooner rather than later summer will be here, accompanied by heat, humidity, and bugs! Just when you start learning to cope with snow, ice, and below 0 days, everything changes and now you’re sweating those upcoming summertime utility bills. Depending on where you live, the size of your home, and how much utility costs are in your area, summer can often bring the highest monthly bills of the year. The good news, however, is that it’s only May and you have time to prepare for those hot summer days and high electric bills, so here are some easy to implement tips to both keep cool at home and save a little money at the same time. Let’s get started! Install programmable thermostats in your home (in each zone, if you have several) rather than just ON/OFF switches. Setting a temperature saves a ton of money because the AC doesn’t just run constantly, but rather only when needed. If you don’t have central air conditioning and instead just have window units, put each one of them on a timer. You can set the cycle to turn the units on and off throughout the day rather than just leave them running. Put ceiling fans in the rooms where you spend the most time. And once they are installed, make sure the blades are spinning in the right direction! In the summer they should be rotating counter clockwise, pushing air towards you downward. While this tip is good all year for saving on energy costs alone, it can also save on your cooling bill. Replace those old fashioned incandescent light bulbs with either CFL or LED bulbs, as they emit far less heat than incandescents. Insulate, insulate, insulate. If your attic isn’t insulated correctly, guess where all that cold air you are paying to pump into your home is going? Yep, right out through the attic rafters into the hot outdoors — wasting a ton of money in the process. Speaking of attics, make sure you have an attic fan. And if you have one, make sure it works! Attic fans draw hot air out of the attic, helping to reduce cooling costs inside your house. Lower your shades and close your curtains, and not just because you’re modest. Blocking the sun from coming in and heating up your space can go a long way towards keeping your space cool. Seal windows and doors efficiently to keep the cold air inside and the hot air outside Weatherstripping costs just a few bucks but goes a long way to keeping the heat out and the cool in. 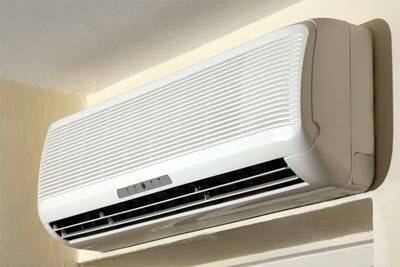 Have your central AC unit serviced and cleaned prior to the hot summer months. HVAC professionals are busy during the first part of summer, so get that taken care of now so your system runs efficiently. Consider using regular old tabletop fans aimed at yourself in one room rather than run your central AC 24/7. Raise the temp of your thermostat by a degree or 2. You won’t feel the difference but your wallet most certainly will. If no one is home all day long, why keep the house ice cold? Turn the temperature up on your thermostat during the day, and program it to bring the temperature back down an hour before you arrive home. Close any central air registers in empty and/or unused rooms. If you use a room in your house as a closet, why air condition it all summer long? Get outdoors and plant shade trees around your home. Sure, it wont help you much this year but it will down the road when energy bills are bound to be higher. Open a few windows upstairs to draw the hot air up and out of the house. Run any hot, energy-intensive appliances sparingly. Instead, consider using the microwave for quick heat-ups rather than turning on the stove or oven. Well, now you have no excuse for not implementing at least a few tips for saving money on your utility bills this summer in an effort to keep cool. Do you have any tips to add to the list? Be sure to let us know in the comment section below! Frugal living and saving advice: The Festival of Frugality #55 is up! Blockbuster vs. Netflix: The Video By Mail Battle! Saturday Freebie – Senseo Coffee Pod System. I live in the OC and it gets pretty hot out here. I actually had a dream last night about a programmable thermostat and just searched it on Bing and I’m surprised it’s affordable! I’m definitely going for it. Funny, I just posted one of my Financial Tips in Five Words: Programmable Thermostat Saves You Money. I like your list for the summer. Thanks.